Barry Kirwan Blog: Will book signings become a thing of the past? Will book signings become a thing of the past? I had an interesting discussion with my publisher yesterday about book signings, and it made me wonder if they will become a thing of the past. I hope not. I did one back in October last year and I am doing another one in a couple of weeks, and I think they are a great way to meet readers, some who've come to buy the book, some who haven't but are maybe a little curious, and talk with them. Of course book signings rarely make any money, after the posters, advertising, selling books with a narrow profit margin, etc. It's even hard to make an 'indirect' business case for them, for example by saying that they will generate new customers who will be more enthusiastic than just buying it off the shelf or from Amazon, and so help get a better base from which to spread the word about a book. But if they don't make any money, why do them? Well, many writers aren't actually doing it for money (and let's face it, it's very hard to make a living as a writer these days, unless you're a best-seller). I'm organizing this one in my home town, and my family will be there and they've been supportive throughout. I also plan to organize another one in Paris sometime later this year for the sequel, because I owe so much to the writing community in Paris itself. So, for me, it's about giving something back, and meeting some new people. Another reason is that it is good for readers - I've been to a few myself and there's just something special about it, and if you have read something by the author, then it can be fascinating to see what the author is actually like. Of course you get a signature and maybe a dedication, which makes the book personal. It's also good for bookshops, who are struggling to compete with online retailers. This is one thing bookshops can do, and can do well, that Amazon can't. It generates a buzz, and they can sell more books on the day, and not just those of the author present. It can become a social event - for example, mine is science fiction, so maybe some scifi people will come and meet other scifi readers. Of course the long term threat is ebooks, currently occupying up to 30% of the sales market. I'm not against ebooks, as both my books are in electronic format too. But even as a science fiction author I find it difficult to imagine an electronic book signing event - or maybe I just don't want to. I can imagine a future where there are no physical books, e.g. 100 years from now. Maybe someone will think of a smart alternative that will replace the book signing event. Until then I'm glad to be around now when an author can still meet readers, sign a book for them, shake their hands, and feel like he or she has done something useful. 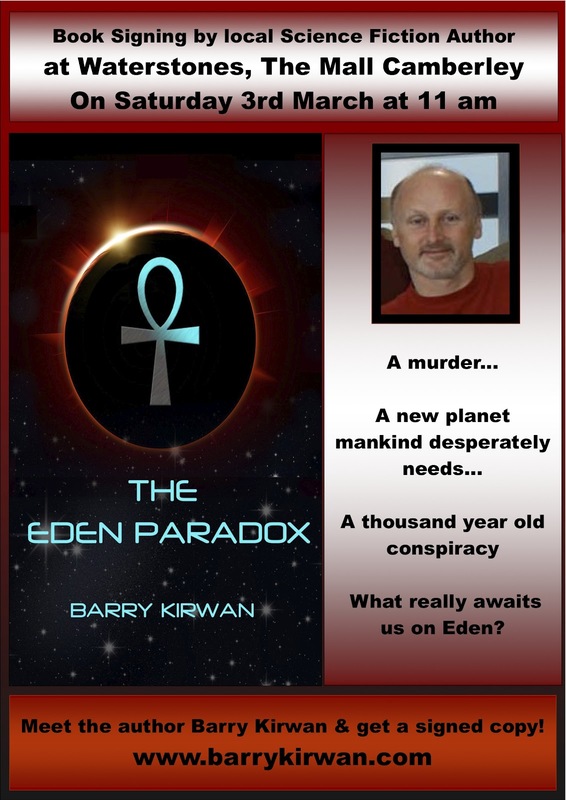 The Eden Paradox A fast-paced Scifi thriller that starts with a murder and ends in a threat to Earth's survival. Available on Amazon in paperback and kindle, Barnes & Noble, and Waterstones, UK. 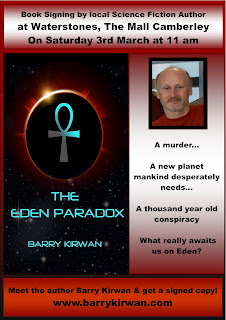 Eden's Trial The stunning sequel where humanity enters a hostile galaxy and will be judged on its fitness to survive. Ebook on Amazon, paperback late 2012. CURRENTLY FREE ON AMAZON PRIME. Eden's Revenge - The trilogy's climax, where the fate of the galaxy will rest in one man's hands - available Ebook end 2012, paperback 2013. I totally agree with what you are saying and it will be a very sad day if the book stores do disappear in years to come! But surely this is up to the people like you and I to keep them alive and buy books in the store. CD's and DVD's are still surviving! I still take the kids to Waterstones where they can choose a book instead of me buying it off the internet, not a lot of children get that experience anymore as society has replaced it with the www. I have bought your book and I have it on my ipod touch as a kindle App, I have the Eden's Trial on App also but when this book comes out in paperback I will buy this also. There's nothing like holding a book and reading it. Well done on the first book, thought it was brilliant and the second book I am also enjoying very much. A new brand of terrorism, or an old one?